Small for gestational age is a medical term used to describe the weight and gestational age of an infant. Just because an infant is small for gestational age doesn’t mean extra care is needed or that the infant will have long-term medical issues similar to preterm infants or low birth weight infants. Though the term small for gestational age may be used interchangeably with low birth weight, they are not the same thing even though there are some medical publications that list low birth weight and small for gestational age as being synonymous. There is a virtual line below which infants must fall to be considered small for gestational age. The line starts about the 24th week of gestation and lasts until the 46th week gestation. Pregnancies that do not end by the 46th week gestation naturally should be delivered by C-section in most western countries. The line defining small for gestational age is constantly moving and the definition can be fine-tuned based on the specific day of gestation, but general guidelines are available. Not all infants born small for gestational age need additional care. Some infants just weigh less, but the body is fully developed as are the lungs and other organs. It is common for small for gestational age infants to be born with no pregnancy or birth complications and live a normal, healthy life without hospital intervention. 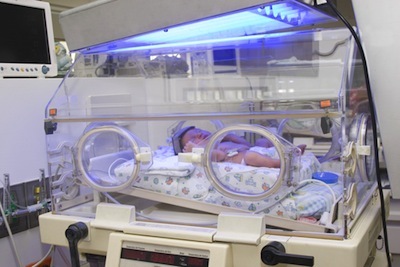 Hospital care for preterm infants deemed small for gestational age is more likely, but not necessarily because of weight. Rather, being born before the body is fully developed can lead to difficulty maintaining body temperature and breathing problems, among other complications. These health problems require extended care in the neonatal intensive care unit and may require a longer than normal hospital stay. Small for gestational age infants are simply smaller than the average infant born of the same gender and gestational age. There is a wide range of normal and for some couples, normal is just smaller. Small for gestational age infants do not necessarily require additional care unless there are other complications, like preterm delivery, associated with the pregnancy and birth.